For millions of people buying a new car or purchasing a new house are much more expensive but much less threatening than changing an operating system on their PC. The reason is simple: Cars and houses are much more standardized and reliable than operating systems. What are the chances of your GPS system not working with the new car or the fridge not operating in the new apartment? And what are the chances of a house or a car being unstable, crashing themselves, turning slow or refusing to operate a new component? Latest 1st2c study of the online response to the release of Windows 7 Beta in early January 2009 suggests that Social Media fosters a new or at least less acknowledged form of decision making behavior – “Attitude-Forming Impulse Behavior”. Unlike traditional decision making behavior, Attitude Forming Impulse behavior is not aimed at an imminent purchase but at the forming of a (socially driven) attitude. And unlike despite entailing significant perceived “risk”, this behavior is notably impulsive and refrains from addressing alternatives. The underlining psychology of “Attitude-Forming Impulse Behavior” offers interesting leverages for marketers in competitive markets. In his keynote on January 8 2008 at the Las-Vegas 2009 CES, Steve Ballmer announced the release of Windows 7 Beta 64-bit version. Actual sales are said to start only late 2009. 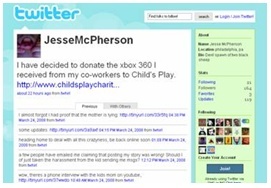 The Beta version was addressed primarily at “Registered Microsoft beta peeps”. But that did not prevent huge media coverage and huge surge in online mind sharing. Actually, as 1st2c monitor shows, the release of Windows 7 Beta version drove at day of announcement more mind-sharing traffic than the last Oscar ceremony. Interestingly, the buzz on Windows 7 even at this pre-marketing Beta phase does not come exclusively from “Techie” communities. Technology fans and mavens do dominate the discussion (and viewership) but do so in a wide variety of social destinations. These include gaming communities, mobile communication communities, motorcycle and car fan communities, investor communities, etc. At this early stage in the introduction of new technology the first two come into play. A quick look at Google search trends for the top 5 operating systems reveals a basic characteristic of impulse behavior – immediate and sharp response. As image 3 shows, share of search for Windows 7 almost instantly more than quadrupled in reaction to the Windows 7 Beta announcement. Interestingly, this surge happened despite the fact that information about the imminent announcement was resonating on the market at least two weeks before the announcement and probably accounts for the visible increase in search before the big surge. It is also noteworthy that besides some increase in search for Windows 7 the predecessor – Vista, interest in all other operating systems remained flat throughout. · While this graph depicts “Mind Sharing” (i.e. volume of posts) traffic in the Social Media space has another critical layer and these are the readers – people who flocked in to read the reviews and discussions but did not author posts or responses themselves. These and other indicators suggest that Social Media facilitated a second and critical ripple of influence after Corporate Media. But perhaps more interesting is that behavior on Social Media featured a unique version of impulse behavior – “Attitude-Forming Impulse Behavior”. This behavior was triggered my marketing, leveraged by mavens and engaged by excited information-hungry users. The uniqueness of this phenomenon is that the massive and instant response was directed at a product that is not “for sale” and has been ignoring alternatives. Massive crowds behaved impulsively… about attitude forming. In the value-chain of influence, Social Media was the facilitator of “Attitude-Forming Impulse Behavior” playing a critical role in forming the market’s first impression – in this case Windows 7. Marketers love to have consumers excited about products that are not even yet on sale. At the same time marketers are also concerned about “wasting ammunition” and creating frustration by exciting consumers about products that are not yet on sale. In the networked marketplace, internet conditions consumers to shop for information and Social Media conditions them to shop for opinion before shopping for the actual products or services. This behavior seems to contradict impulse shopping. The Windows 7 Beta case suggests that information and opinion gathering may stand between interest and decision but can also be impulse driven! Furthermore, Attitude Forming Impulse behavior may be harnessed as a pre-sale tool and may be an effective blocker of competition. The idea of pepping consumers to learn and talk about a product before it is actually “on the shelves” offers exciting opportunities for marketers is competitive markers. It can actually redefine the whole idea of “Pre-Sale”. Digital space, both marketer media and social media, offers natural and cost-effective platforms to for such initiatives. 1st2c (www.1st2c.com) is the home of Online Strategizing Research©. 1st2c specialized in the most comprehensive data-to-strategy methodology in the networked market. 1st2c monitors all major Social Media platforms and mines consumer dialog and interaction for actionable insights and opportunities. 1st2c works with Fortune 500 companies on adding new dimensions to overall marketing strategy and on monitoring and engaging the networked market. When the nation’s mortgage companies are “on the verge of collapse” [WSJ, July 13, 08] that’s a big reason to get worried. But while Social Media resonance on the crisis spiked tremendously (as one would expect) it doesn’t spell panic and doesn’t call for consumer emergency action (ignoring ongoing crisis-talk on the agenda-setting mass media). 1st2c monitored the consumer response to the crisis on Social Media, uncovering key insights on the dynamics of Social Media in facilitating threat management “by the people – for the people”. When the news hit the market the American publishes was pretty much pepped up to worry. The media has been talking economic doom for a long time now. Recession, depression, downturn, rocketing interest rates, hiking living costs, plummeting housing market are only few of the labels spelled out by news and commentaries. It’s not surprising that these are hot topics in consumers dialog on Internet’s Social Media space. But the Freddie Mac and Fannie Mae crisis was supposed to take the threat a notch higher. After all, these giants touch more than half of the nation’s $12 Trillion mortgages! According to publications these banks may default on their huge debt, government guarantees will effectively double the public debt, and that their difficulties may damage economies worldwide since the securities of Fannie and Freddie are held by numerous overseas financial institutions, central banks and investors. But public confidence may be even more undermined by immediate implications on individual consumers. If the two banks are unable to borrow, they will not be able to buy mortgages from commercial lenders. In turn, that would make it more expensive and difficult, if not impossible, for home buyers to obtain credit, freezing the United States housing market (NYTimes, July 11, 2008). It was only natural for consumers to see the unfolding event in terms of crisis. In the age of the networked market it was only natural for consumers to share “intelligence” and minds, to seek peer advice and support and perhaps also to mobilize to act upon the crisis. As 1st2c tracking system shows, the event did trigger a surge in volume of consumer conversations across Social Media platforms. But was it panic talk? – And interestingly also automobile fan communities…. 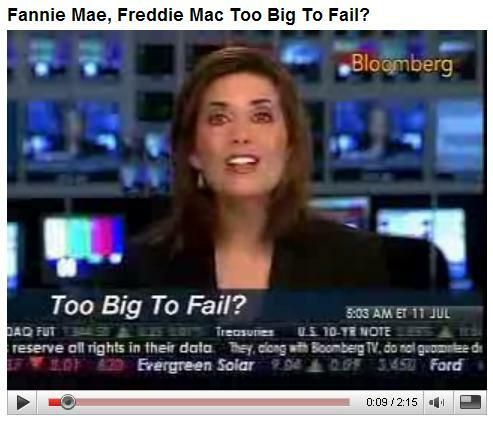 A Bloomberg TV commentary from Jul 11 2008 quoted congressional leads from both parties saying that Freddie Mach and Fannie Mae are “too big for the government to let them fail” (YouTube). This assumption, though sometimes challenged (“… and too big to be bailed out”), is the underlying sentiment among the networked public. In many respects, Social Media played a balancing role to the mass media, in shaping public understanding and reaction to the mortgage bank crisis. Social media did not simply play along with corporate media. When consumers talked to other consumers they essentially helped frame the crisis as “not on our turf”. Consumer dialog identified the threat not on a personal level but a systemic level. The magnitude of threat was discussed in terms of passing the threshold of uncertainty about the imminence government intervention. So while the media continued to preoccupy with whom and what can curb the threat, Social Media already echoed with a clearer notion of “beyond the worry threshold”. Market dynamics may change and future developments might alter public response to the unfolding economic developments. But this situation analysis does provide deeper insights into how Social Media helps shape public perceptions and behavior. The Freddie Mac and Fannie Mae case study highlights the fact that Social Media is a socially-driven platform for identifying and meeting of unmet needs. In this case, the need was for threat relevance understanding as aspect of threat management. In this case, consumer used Social Media to balance and control rather than stir and demonize. It would also be worthwhile for marketers to take note of the anthropological aspect of the dynamics of social influence to understand what social environments and mechanisms facilitate and energize the “Social ripple of influence”. Online commercial platforms such as ebay.com and amazon.com were popular commerce channels for holiday shoppers this Christmas. While the majority of consumers used these online commercial websites a new channel of online consumer commerce began to gain traction. Online forums/message boards were used by consumers to buy and sale items during this Christmas holiday. This new form of commerce resembled in structure to peer-to-peer networks. Peer-to-peer networks in which have gained popularity for downloading music and movie files has influenced a new trend in consumer commerce. Consumers from across the United States communicated via online forums/message boards in order to buy and sell goods and have created a new form of online consumer commerce, consumer-to-consumer networks. Similar to the p2p networks, each consumer either buying or selling represented a node in which together formed a social network of online consumer commerce. The demand for the Nintendo Wii game console soared this holiday season. Retailers both online and off line were not able to match the consumer demand for this hot holiday item. We at 1st2c discovered that the consumer-to-consumer online network empowered consumers by offering them a additional platform to purchase the Wii gaming console. Via online forums/message boards people bought and sold Wii consoles without the assistance of traditional online commerce platforms such as ebay.com, walmart.com, and amazon.com. In addition, consumer-to-consumer online commerce were in some instances the only channel for consumers to obtain a Wii console for this Christmas holiday due to the lack of availability of main stream online commerce platforms . Using 1st2c‘s deep web monitoring technology we saw that consumer discussions of this secondary market was substantial and grew as the Christmas holiday approached. This social commerce channel that developed increased the availability of the Wii to consumers during the holiday season. In addition, it increased the growth of secondary gaming console markets. Consumers that had the Wii game console previous to this holiday rush had the opportunity to sale via the consumer-to-consumer commerce channel and use the revenue to purchase another gaming console or software. An example of this phenomena was observed by our research team in the consumer cell phone market. Consumers used the consumer-to-consumer channel through CGM platforms (ie forums/message boards) to sell their cell phone in order to purchase a new model via traditional retail channels. This form of commerce reduced the duration and financial barriers that consumers faced when deciding if to upgrade to a new cell phone. The emergence of consumer-to-consumer commerce via social channels (ie forums/message boards) poses some important questions regarding retail markets and marketing of consumer goods. 1. What can be learned from social commerce and adapted to retail commerce? 2. What consumer insights can be learned from social commerce? 3. How can marketing techniques adapt to the evolving social consumer generated media platforms such forums/message boards, blogs, videos and social networks? We will continue to follow this CGM trend as it evolves in order to provide our clients with tools to maximize their marketing impact and ROI. 1st2c (www.1st2c.com) is the home of online Online Strategizing Research© – the most comprehensive data-to-strategy methodology available for the networked market. Strategizing Research©’s insight and opportunity driven orientation creates a vivid picture of mindsets and behaviors of the networked marketplace and adds new dimensions to both online and offline strategies. March 12, 2008. A young web developer returned from a convention to find out that his home was broken into and his Xbox, computer and TV have been stolen. He did notify the police about the theft but also decided to launch an investigation of his own using the internet to try track down the burglar and his property. Little did he expect that his choice of Social Media tools will mobilize massive social activism on an international scale, become a media story and, yes, help find the villain. This is no anecdotal (digital) detective story. Social mobilization is the essence of digital marketing. Viral mobilization is the El-Dorado. The immediacy and magnitude of social activism triggered in this incident suggest that it may be a case study for better understanding what drives successful viral consumer engagement. Just like the Toy Story movie hero Buzz Lightyear, McFEARsome (our hero’s Blogging name) set out to find his lost property with the help of Internet. Starting off as a lone range he used Google Maps to locate a pawn shop where a surveillance camera picked up a young man trying to sell a computer that matched the description of his. Then, a few days later, his work friends pitched in and purchased him a new Xbox 360. As he logged into his Xbox live network he received a voice message demanding ransom in return for his stolen console. Facing a “hostage situation”, McFEARsome turn to Social Media. What started out as sharing misfortune on his personal blog, http://blog.mcfearsome.com, and posting it on one of the popular social news rating site Digg.com turned quickly to a viral social mobilization phenomena. Not only did McFEARsome’s blog register 363,779 visits and 610,457 page views In 5 days, but a massive ripple effect of online rich-media peer initiatives was triggered. 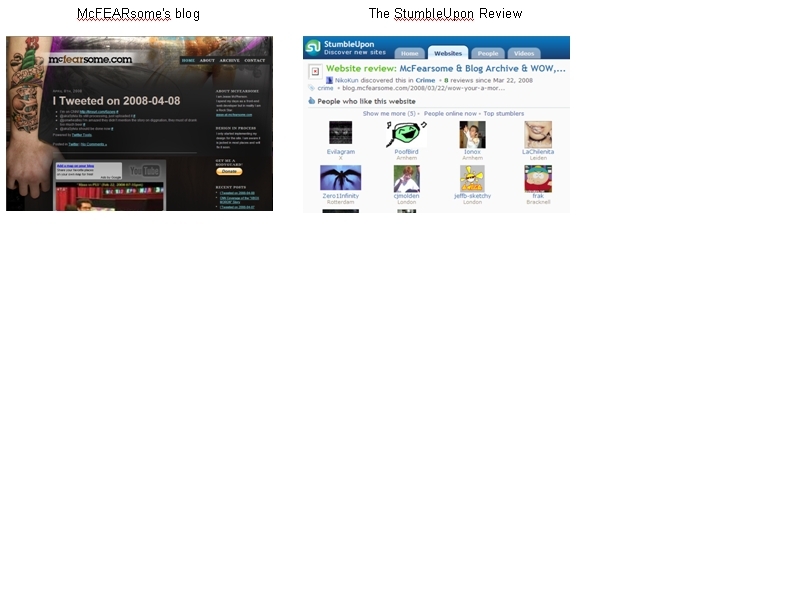 It all started out from McFEARsome’s personal blog, and then rippled to other peer blogs. But what gave an extra boost to the virality of McFEARsome’s story was the resonance it got on website and user generated content (UGC) discovery and ranking applications like www.StumbleUpon.com. The recently booming micro blogging platform, Twitter, was used as an ongoing “instant messaging style” updating and network maintenance tool. With the help of the more typically activist audiences (like bloggers), McFEARsome’s story also drove broad resonance and followership among wider publics. 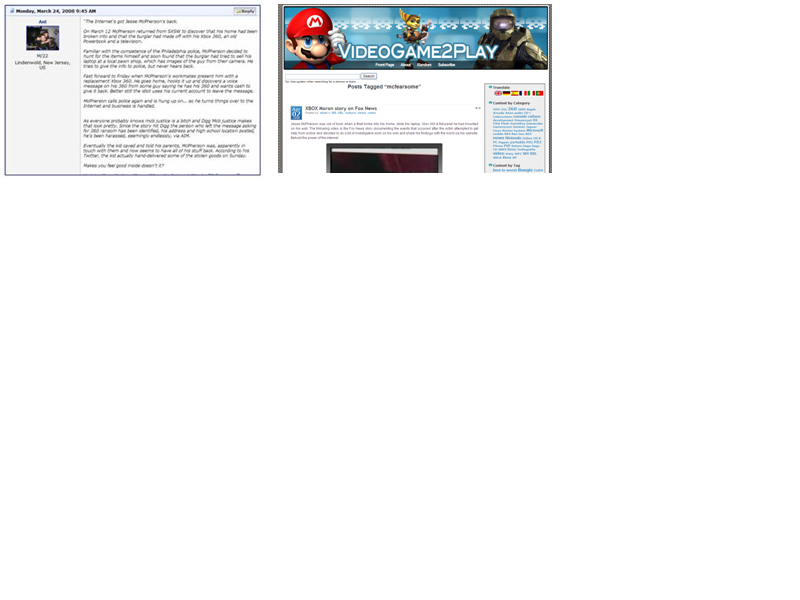 The story hit waves both in general forums and message-boards and in more issue-relevant niche communities like www.VideoGame2Play.com (see: stolen game console). 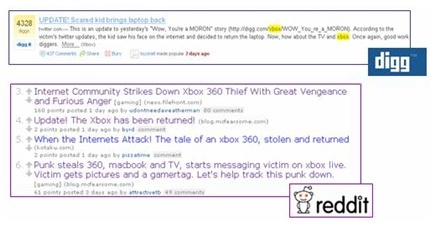 The initial posting of McFEARsome’s story on Digg.com than spread to other popular news rating destinations like Reddit.com. Popular voting quickly had the story ranked high, causing an accelerated spread of the news and the social mobilization initiative. Much of the talk was not just descriptive but also framing of the situation as a sweeping movement and “factualizing” its success in an apparent aim to drive a Pygmalion (self-fulfilling prophecy) effect. McFEARsome’s digital vigilante movement won him his Xbox back and the one given to him by his workmates he donates to children’s charity. But this story is beyond anecdotal. It’s significance to digital marketing lies in “back engineering” the drivers and dynamics of consumer-driven (“organic”) digital mobilization. Understanding of the determinants of spontaneous consumer mobilization may help define and refine the blueprint for a managed triggering of such mobilization. 1st2c (www.1st2c.com) is the home of Online Strategizing Research© – the most comprehensive data-to-action methodology in the networked market. Online Strategizing Research© specializes in consumer-driven insight and opportunity exploration, and their translation to marketing and communications. 1st2c technology provides cross platform deep-web monitoring and advanced emotional engagement analysis. 1st2c is working with Fortune 500 companies, consulting companies, MarCom agencies to stay ahead of the networked market game. 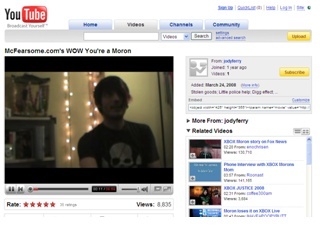 Ebay’s seller boycott of February 2008 calls attention to the scenario of users turning your own platform against you. Late January 2008 eBay, the iconic online auction powerhouse, announced changes in fees and policy with primarily effect on selling. This policy change probably made good business sense for eBay that probably anticipated some seller disgruntlement. Regardless of the eventual culmination of the eBay incident, it calls attention to the not-improbable scenario of users “overtaking” open networking or commerce platforms and turning them against their own operator interests. We label this situation: “Social Media-Hijacking“. This case study looks at the dynamics of this incident of Social Media-Hijacking and addresses the key strategies for managing such situations. Late January 2008 eBay announced it would charge sellers 25%-50% less to list their items on the site but take a larger slice of fees on actual sell of items. At the same time eBay terminated the ability for sellers to submit negative feedback on their customers and impose 21-day holds on transactions in certain circumstances. These policy changes drove a semi-organized group of “power sellers” who felt shortchanged over the recent changes to mobilize a popular boycott on eBay. But something seems to have gone wrong for the mutineers. The results of the protest were unclear and much disputed. Online auction trackers such as PowerSellersUnite and Medved reported that eBay’s total auction listings may have dropped as much as 13 per cent over the week. But in effect listings returned to normal levels (eBay ran a one-day discount listing promotion the week before). A deep dive into Social Media surfaces additional insights that shed light on the dynamics of the eBay boycott. In retrospective, Social Media seemed to have provided an efficient “early reading” of public engagement and of the reasons for the failure of this potential crisis to gain momentum. The eBay boycott failed to snowball to a crisis situation for eBay. However, surfacing of the reasons for that failure does improve our understanding of the determinants of grassroots mobilization in the digital marketplace. After all, the understanding what doesn’t work provide clues to the understanding of what does work. But the eBay boycott also draws attention to the diversity of interfaces available to users and consumers in open commerce properties like eBay, Amazon, Overstock, etc. This incident demonstrates the fact that activist users and consumers are well aware and ready to take advantage of interaction and content generation platforms OTHER than those designated for peer-to-peer networking. Ebay does have a very busy discussion board platform, but “enterprising” protestors attempted to “hijack” its commerce platform – a critical interface with buyer audiences. Regardless of how successful this particular attempt was it may warrant extra attention from all social platform operators, reputation management and crisis management experts. What will be the most effective strategy alternative to manage such situations? The answer may well be a combination of strategies or even a changing combination of strategies depending on the particular situation and the dynamic of market response. In view of the increasingly informed, involved, active and socially empowered nature of consumers in the networked marketplace, decision makers and specialists may benefit from readiness to Social Media-Hijacking situations by mapping of scenarios and evaluating potential actions. 1st2c (www.1st2c.com) is the home of Online Strategizing Research© – the most comprehensive data-to-strategy approach in the networked market. Online Strategizing Research© creates a vivid picture of the marketplace and its dynamics and identifies actionable insights and opportunities. 1st2c works with marketers and agencies to empower competitiveness and facilitate growth by monitoring and engaging the networked market and adding new dimensions to overall marketing strategy. Social Media is already challenging the hegemony of commercial media, but has it already begun to incubate a challenge (or an opportunity) for commercial trade? This holiday season saw the age old phenomenon of Social Trade being energized and re-shaped by Social Media has been spotted in the game console market. The lively consumer-to-consumer trading of Nintendo Wii consoles was a vivid example for how Social Networks develop as an alternative (or a parallel) to online commercial trade channels. The Nintendo Wii case suggests the (re)-emergence of Social-Trade-over-Social-Media as a market force to be reckoned with and managed. Nintendo Wii has already been widely celebrated as one of the mega-hits of the 2007 holiday season. Fueled by media publications about supply shortage, thousands of desperate consumers reportedly skimmed store shelves and turned to online commercial outlets like Amazon and eBay, willing to pay even a premium price of $600 per Wii console. No wonder that below market surface determined consumers turned to Social Media networks not only to find the prized console but also to buy and sell one. 1st2c tracking system picked up a significant increase in volume of posts in social networks during the holiday season, offering Nintendo Wii for sale. Overall number of posts on Wii (21,140) is impressive in itself. Additional terminologies used for with the same intention increase the post count even further. The surge in offers for selling Nintendo Wii consoles started mid-November and stayed at above normal levels throughout the holiday season, with fluctuations triggered occasionally by both online and offline media publications. The vast majority of the posts seem authentic, though it is not unreasonable to assume that some were placed by traders masquerading as consumers. Regardless of who placed the offerings, the most important insight is about the emerging use of social networks as social trading platforms. Nintendo Wii is just one example for the developing phenomena of Social Media platforms becoming Social Trading platforms. The case on Nintendo Wii refers to new products traded via social platforms, but what about used (second hand) products? Recent projects we have done in the mobile communication market identified a very active scene in Social Trading of used handsets. Typically, first and second tier mobile users are offering their old handset for sale on commercial online trading platforms like Ebay. But the Social Networking platforms are already featuring the same function driven by consumers themselves. What Social Media offers to these grass-roots traders is a highly segmented shared-interest audience and a highly trusted environment. For some types of consumers it lowers the barriers of migration to next generation handsets by offsetting the costs against the resale value of their old handsets. For other consumers it allows entry to mobile communication. Social Commerce grows and is likely to continue to develop. For many marketers, Social Commerce poses a threat since it bypasses commercial trading platforms with established trading and promotion infrastructure. The more consumers shift to social commerce the less control marketers have on what is being offered, how it is being offered and the entire marketer-consumer relationship that follows. On the other hand, Social Networks can potentially act as market catalysts. They may eliminate availability barriers (a consumer in Timbuktu can make a product available to a consumer in New York). They may accelerate purchase cycles – especially with more costly products (now it’s easier for early adopters to migrate to next generation products but selling the older product they have). They may provide more people more access to a broad variety of products. They facilitate the power of buzz. Can and should marketers try to manage Social Commerce? As Social Networks acquire an increasingly critical role in the driving market behavior it becomes a question not of If but of HOW. Isn’t it another dimension to Social Marketing, guerilla micro-marketing online buzz agents? The right models will need to account for the new rules of engagement in the networked market (see our pervious case studies). Interestingly (and perhaps expectedly) we have found Social Trading to sprouting with premium positioned brands. Aspirational brands in diverse markets such as apparel, cars and consumer electronics are already developing Social Commerce. From both marketing and reputation management considerations, marketers of such brands may benefit from tracking and perhaps also from creating a model for managing online Social Commerce. 1st2c (www.1st2c.com) is the home of online Online Strategizing Research©. It is the most comprehensive data-to-strategy methodology in the networked market. Online Strategizing Research© creates a vivid picture of live market mindsets and behaviors and identifies actionable insights and opportunities. The early 80’s introduced the music video to the masses via MTV. The music television channel was the first station to offer 24 hour-a-day music videos to the masses. The music industry embraced the music video concept and started pumping videos on a weekly basis. The successful adoption of cable TV by US consumers and the development of relatively low cost and easy to use video recording/editing equipment were the catalyst that made MTV and the music video in specific very successful. As the popularity of the music video grew so did the cost of making them. 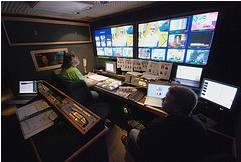 Music videos seemed to outdo one another by increasing production costs and special effects. The growth and popularity of music video caused their budgets to increase and resemble a major motion picture operation. In addition, by 1992 directors of music videos were getting recognition and their names were being listed in the song credits. The internet boom, in particular the growth and popularity of videos being viewed, rated, and uploaded onto internet platforms such as Youtube and Metacafe have caused a major shift in consumer viewer ship and interaction. Consumers can now choose which music videos they wish to view, rate , and write commentary about them. In addition, consumers have become producers of music videos themselves. Todays youth have access to tools needed to create their own music video. With the help of a camcorder, computer, and some basic editing and internet knowledge anyone can produce a music video. This form of consumer generated media (CGM) has become extremely popular among todays internet savvy youth and should be taken noted by the music industry. Some of the top videos on Youtube were produced by consumers. A great example of a consumer generated music video can be seen below. The producer of this music video used a song by Daft Punk and their bare hands in order to create this CGM masterpiece that was viewed by 11,884,528 people on Youtube. The name of this music video is called Daft Hands and was produced by FrEckleStudios. Overal, embracing consumer generated content will assist music labels in promoting their music and increasing its reach to consumers in a effective and economical manner.